HEC Montréal professors took two of the four awards presented last evening at the 14th annual Coop HEC Montréal Business Book Awards, an eloquent tribute to their quality. Le management stratégique beat out all the other contenders and was crowned the Best Business Book in 2009. Its co-authors, professors Francine Séguin, Taïeb Hafsi and Christiane Demers, will share the $10,000 cash prize. Responsabilité sociale de l’entreprise won in the Best Educational Business Book category, earning its author a $1,000 prize. The book was published under the direction of Professor Emmanuel Raufflet and Pierre Batellier, Co-ordinator, Sustainable Development, at HEC Montréal. 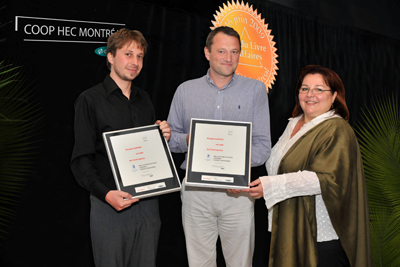 In the same category, a special jury mention went to Gestion en contexte interculturel, directed by Jean-Pierre Dupuis and Jean-François Chanlat, respectively Full Professor and Affiliated Professor, and Eduardo Davel, Management Professor with the UQAM Télé-université, who graduated with a PhD from HEC Montréal in 2006. Organized by Coop HEC Montréal, the 2009 Business Book Awards were attended by some 170 guests from the business community and the publishing industry, as well as academia and the media. The very popular event also saw the 2009 Prix hommage presented to Jacques Ménard, Chair of the Board of BMO Nesbitt Burns and President of the BMO Financial Group, Quebec, for his contribution to the business world and society over the years. Mr. Ménard is co-author of Si on s’y mettait, a finalist in the Best Business Book Award category this year. The event was also the opportunity to launch the most recent book by Alain Dubuc, entitled Les démons du capitalisme, and for a signing session. 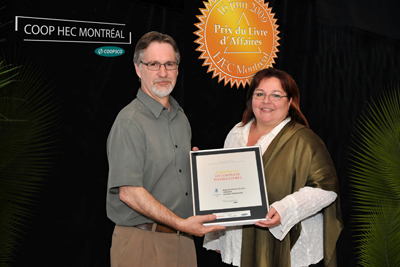 Mr. Dubuc was the winner of the 2007 Best Business Book Award for Éloge de la richesse. Over 50 literary works in the areas of business and economics were submitted to the competition selection committee by Quebec publishers. The committee, chaired by Michel Nadeau, Executive Director of the Institute for Governance of Private and Public Organizations, had the difficult task of studying the entries and choosing 23finalists in four categories. Click here for the complete list of winners and finalists in the 2009 Business Book Awards. Jean-François St-Pierre, Director of the Coop HEC Montréal book store, co-winners Christiane Demers, Taïeb Hafsi and Francine Séguin, and Michel Nadeau, Chair of the jury and Executive Director of the Institute for Governance of Private and Public Organizations. Pierre Batellier, Co-ordinator, Sustainable Development at HEC Montréal, Professor Emmanuel Raufflet and MartineThomas, President of the Fédération des coopératives en milieu scolaire du Québec. Professor Jean-Pierre Dupuis and Martine Thomas, President of the Fédération des coopératives en milieu scolaire du Québec.